New data released by the Association of Mutual Funds of India (AMFI) has thrown up some interesting insights into how India invests in Equity Linked Savings Schemes (ELSS). These are essentially tax-saving mutual funds that invest primarily in equities, but have several other benefits too. However, ELSS funds have not traditionally been as popular as they should have been. New data released by the Association of Mutual Funds of India (AMFI) has thrown up some interesting insights into how India invests in Equity Linked Savings Schemes (ELSS). These are tax-saving mutual funds that invest primarily in equities. These funds earn the investor a tax break under Section 80C of the Income Tax Act. Investing in ELSS funds has many advantages apart from the tax deduction--equity exposure to earn inflation-beating returns, lowest lock-in period among tax-saving investments of only three years, and no compulsion to continue investing, among others. However, ELSS funds have not traditionally been as popular as they should have been. Data shows that most taxpayers prefer fixed income tax-saving investments like the Public Provident Fund (PPF) or Employee Provident Fund (EPF) to fulfill their tax-saving obligations. ELSS funds have the capability to turn into better long-term investments but the equity-related risks that come with them is what turns investors away. However, this trend seems to be shifting. ELSS funds have the ability to earn inflation-beating returns over the long-term, which is something that guaranteed-returns investments cannot do. More and more taxpayers are now looking to invest in ELSS funds to earn the dual benefit of saving taxes and building long-term wealth. Data from AMFI for the last couple of financial years shows this change in trend. 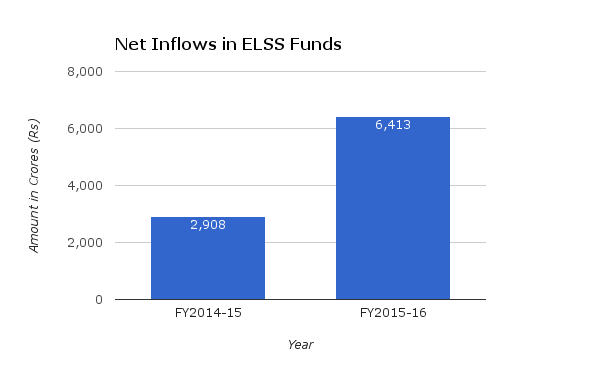 As can be seen from the graph above, there has been a significant increase in the net inflows into ELSS funds between FY2014-15 and FY2015-16. In fact, there has been a two-fold increase. 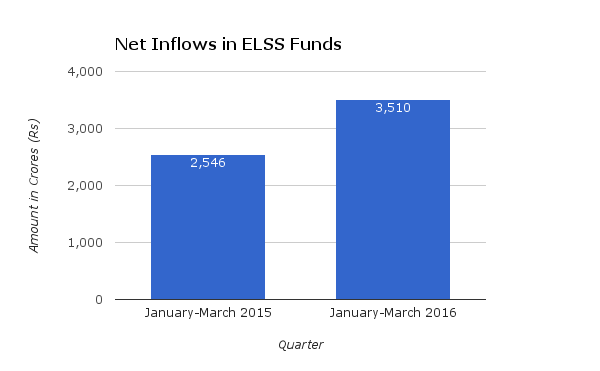 Net inflows going from ₹2908 crore to ₹6413 crore speaks volumes about the return of investors' faith in ELSS funds. Even in the last quarter of the financial year, the net inflows went up between January and March 2015 as compared to between January and March 2016. What makes these numbers even more impressive is how the broader equity markets have fared in these periods. For example, while the Sensex went up by nearly 5,500 points in FY2014-15, it actually went down by around 3,100 points in FY2015-16. Given this underperformance, net inflows into ELSS funds should have probably gone down. That is how the Indian investor has traditionally behaved. But thankfully, not this time. Investors have shown a move towards ELSS funds and that spells great news for everyone involved --including the investor. ELSS funds have the ability to earn inflation-beating returns over the long-term, which is something that guaranteed-returns investments cannot do. Hence, ELSS funds are an expert-recommended tax-saving investment. It is good to see more and more people investing in them and this is one bandwagon that you should be jumping into.